There are two basic principles that make SuraFlow-GutterGuard so effective. 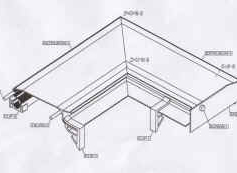 The first is that it is a solid cover of anodised aluminium that sits over the gutter through which nothing can penetrate. The second is the use of the Coanda Effect, first discovered by Romanian aerodynamicist Henri-Marie Coanda (1885-1972) in 1930 to ensure that the water is drained away by the gutter beneath. Coanda observed that a stream of air (or any other fluid, including water) tends to follow a neatly curved surface. You can demonstrate this effect yourself by holding the back of a spoon lightly into a stream of water from a tap. The water will bend round the back of the spoon. (If you hold the spoon light in your fingers you will feel it pulling into the stream which is the same effect that makes an airplane fly!) This effect is the reason why window and door sills have drip edges, to stop rainwater running back to the wall and causing damp. It is also the reason why some teapots drip from their spouts! There are a number of other key factors that ensures the SuraFlow-GutterGuard system is effective in keeping debris of gutters while allowing the water to flow in. The anodized aluminium surface of SuraFlow-GutterGuard system has very low oil/wax content and is slightly porous. This helps reduce surface tension of the water which under normal circumstances would bead, but with the SuraFlow-GutterGuard system, the water forms into a micron thick layer which adheres to the contour of the bend, flowing over the surface into the gutter below. Larger objects such a leaves needles that are likely to have been washed down from the roof are unable to remain in suspension as the water travels around the bend, because of the ‘thinness’ of the layer of water, and as such are expelled from the surface onto the floor below. Water handling capacity is measured in litres per millimetre per metre width. In the UK it is generally accepted that existing gutter systems will handle a maximum rainfall of 75mm/hour. The SuraFlow-GutterGuard system has been tested and proved to handle 40 litres/min/m, which on a 10m roof length equates to 40mm/min (2400mm/hour), or 32 times the accepted maximum rainfall for mainland UK. The main principle is that the SuraFlow-GutterGuard system provides a total physical barrier to leaves falling into the gutter. Any that settle on top of the system are mainly blown off, even wet ones as they dry. Moss is shown to roll directly over the section, or if wet, again will be blown off when dried. Smaller leaves and pine needle are washed over the section, generally failing to adhere to the curved front section. 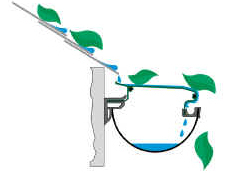 Some small parts of leaves, lichen, soil or tile dust may be left in suspension in the rain and may follow the curve into the gutter. 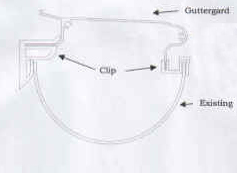 In this event it has been demonstrated that any debris small enough to be held in suspension will be flushed away once in the gutter with the normal flow of water. Is exclusive to Younger Marketing Management and is not supplied by anyone else in the UK other than SuraFlow authorised installers or distributors. As such it should not be confused with nor is it compatible with any similar gutter guard or leaf guard products that may be available in the UK.